Popular messaging platform Viber announced an update to its mobile app today that includes an overhaul of its Chat Extensions feature, offering users access to a raft of sources of third-party content right from within the chat window. Starting today, directly in their private chat screen, users can find and share their favorite videos from YouTube, songs from Spotify, the perfect stay from Booking.com and soon compelling original content from VICE Media. Alongside these providers, users can find other valuable content to enrich their conversations from GIPHY, Guggy and Getty Images. One of the feature's being highlighted by the company is the addition of the YouTube extension. 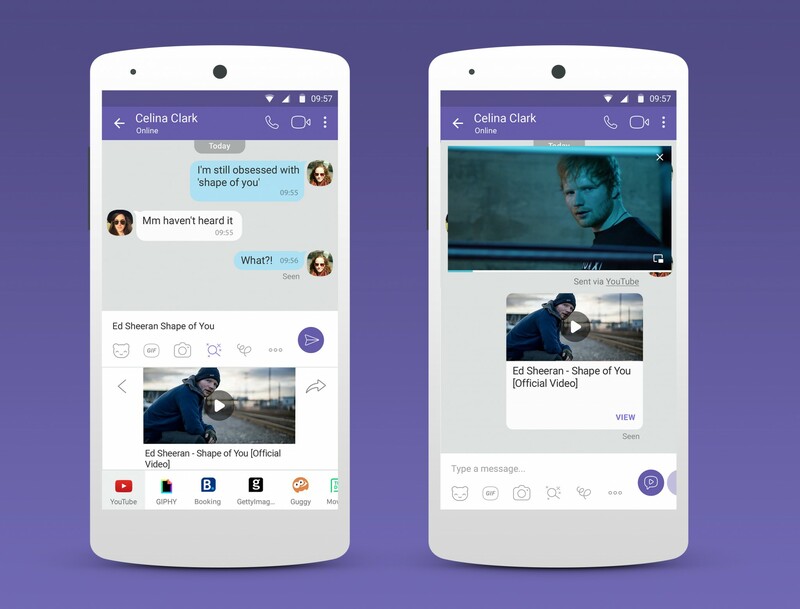 Viber said YouTube videos were among the most popular form of link-sharing among its users worldwide, and now Google's video platform is accessible directly within the chat screen. Users can search, share and even play YouTube videos without leaving their conversations. Elsewhere, the Spotify extension allows users to access all of their music and share it in the chat app, while the VICE chat extension brings content spanning news, culture, food, fashion, music, sports, tech and more. "Viber's Chat Extensions platform is an exciting environment for VICE’s stories," said Sterling Proffer, Senior Vice President, Head of Business Strategy & Development for VICE. "As we continue to aggressively grow our cross-platform distribution, it's still context that matters most. The stories we tell are great additions to any conversation, and making that effort seamless to Viber's 800 million users is a no-brainer." Viber said it would also launch local services in Russia, Bulgaria, Hungary, Philippines and elsewhere. Based on its API, selected content and service providers will be able to build their own chat extensions and create new ways for users to enrich their chats.